There are 6 reviews for 'Asdivine Cross'. I absolutely love this game; and I have played it a few times. It has replay value, and it has many hours of gameplay. The post-game content is like another game in itself. As already written in another review, the post-game is dum-dee-dum since you have to repeat the entire story before you get to the juicy new stuff. You keep everything you earned, (except Arena achievements). Because of that, the enemies are just a nuisance to have to battle since they are no challenge. Fortunately, you’re able to earn items from the Arena to improve that experience. You can earn equipment that increases the chance of Metal mons appearing. You can also “attract” enemies to help Quests go by quicker. Post-game does offer perks such as speeding up text you already saw in the previous play-through. Quite a few new areas unlock. They are fun and challenging. The new areas add a whole new dimension, depth, and feel to the game. Cross is a classic-style RPG with turn-based combat, leveling-up, and grinding. The story has a linear design, but as the game progresses and you gain more travel options, you are able to explore other areas as you choose. That feature is what adds to the ability of this game being re-playable. There is never any question about what-to-do-next; and the world is open to explore. The dialogue is the only real complaint I have about this game. Much of the dialogue propels the game forward and adds to character development. However, there is too much dialogue that is unnecessarily long, juvenile, extraneous, inappropriate, and redundant- sometimes to the point where it becomes just too much and too annoying. Throughout the game, we learn, and feel, many of the emotions of the three main ladies. Their background stories are well-written and poignant. For Harvey, the exact opposite is true, even though I found him to be the most likable and lovable character. The ending with Harvey and Olivia is the most realistic and acceptable. The other endings were silly and childlike in some ways. Some dialogue is tear-jerking. (Maybe because I’m a sappy girl.) Some dialogue is incredibly funny. For a game to cause that gamut of emotion for a player, that proves the writing style and ability to improve the game’s dialogue exist. It should have been that style all the way through the game. Since some of the dialogue is shallow, it is like the storyline is written by two totally different people. In summ, I have love-hate feelings for the dialogue. Weapon crafting and amalgamation are always winners with me. In Cross, we get to amalgamate some really strong weapons into unfathomably stronger ones. The strong weapons are perfect for bonus events and areas. But for storyline gameplay, those weapons make your team OP to the point of becoming boring. When that occurs, every enemy presents little-to-no challenge, and you one-shot the final boss. Lengthy & Replayable. Worth the Purchase Price. Recently, there’s been quite a lot of Kemco games where you customize some of the effects of the weapon. You know, adding HP, Str, Recover HP, inflict status, etc etc etc. I’ve played a lot of them (not all), and from what I can tell, this is the best one. There’s no crazy mechanic that you can abuse, and more importantly, there’s no mind-grinding things you need to do, since post-game equipments will do that for you. Specifically, later accessories will level up your skills without you actually using them. All of them. That is so nice. Something Asdivine Menace lacked. And then, there’s a character who can learn enemy skill. And, you can take the easy way out by purchasing gem-only items. Gems are relatively easy to come by. Yay. Later accessories will automatically level up your skills. Lots of good equipments, but none of them are overpowered that destroys the balance. For the first time, we have someone who can learn enemy skills! Neat! Once you beat the normal mode, you have to start again from the beginning -- waste of time. Getting the enemy skills can be annoying, but you have an easy way out -- purchase using gems. 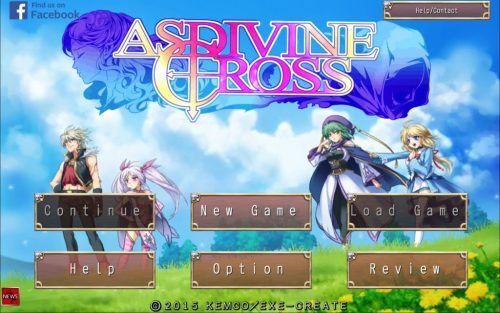 Asdivine Cross was something that surprised me a lot. First of all because the company that made it was nothing more and nothing less than KEMCO, this company here in Brazil we idolized it for having made one of the best racing games of all time, which is the series TOP GEAR. I did not think that this company still existed and even more, doing RPG’s in Old School style, and at a level as beautiful as Asdivine Cross, that game if media had been properly recognized, as it is better than many RPG’s known. the story about Harvey and his friends is told very smooth, no winding, dynamic and very funny. Or rather, his post on Forum about Fairyland grinding did. But after starting anew, following the tips and walkthroughs here, this is in overall a pretty cool game. In fact, most of it was because on Fairyland I got level 53 (you know, battle shortcut is a great thing to have…) and because I got a Rune Sword – so Harvey killed Void elemental monsters without a sweat. It’s Asdivine, and in fact, if you’re seeking for something very different than Asdivine Dios or Menace, you’re looking at the wrong place. But if you liked Dios and Menace, you ought to like this one too. New Game+ is required for reaching True End, however, as the only thing which is reset are chests (so I got to open the same chests twice!! ), you should be back at the place where normal and true end diverges within very few hours. I do have one complaint, though: Some maps are enraging. While most maps are well-drawn, and there’s a huge diversity for gameplay (like minecarts puzzles, and such), when going from a place to another, sometimes, you’re forced to revisit a dungeon – and this does not happens only once. In fact, walking on the same dungeon, doing the same path, back and forth, to progress on main story is what took a star off Gameplay. Already explained about gameplay above, I simply got sick walking back and forth the same dungeon. No problems with controls, they were easy to use (but finding a couple of chests was walkthrough-only), story is well written/presented, and I like battles on Asdivine. And while I didn’t like having only 9 skill points available for each character, I probably wouldn’t use magic in battles without it, so it was a smart gameplay move, which made more difficult fights interesting. I would consider buying the premium version of this game. Things to be mindful of when playing Asdivine Cross?